Happy new year from the team at DomaCom. We wish you every success in your business in 2016 and look forward to helping you achieve your clients’ goals and those of your business. At DomaCom, we are looking forward to what promises to be a very busy and exciting year with several product enhancements and new products in the pipeline. The DomaCom Fund continues to grow with over 1,000 investors currently owning fractional interests in many properties. We have increased our APL listing to 35 AFSLs and our Accredited Adviser numbers have grown to 315. With 5 and 10 year holding and ‘if sold’ projections based on no debt property purchases, advisers can provide an asset allocation solution with minimal risk and diversification. A geared model will also become available as DomaCom finalises a lending solution for the fractional fund. The Simulator model will be available to all DomaCom accredited advisers along with client presentation material. Sidney Kidman founded the company, S. Kidman & Co. Ltd, in 1899 at the age of 42 as a small business with his brother in driving and trading cattle and horses. He built the business into the world’s largest privately owned landholding that, at its peak ran more than 600,000 cattle and 200,000 sheep. Sidney came up the hard way starting as a roustabout and bullock driver, drover, stockman and trader servicing the new mining towns springing up in outback New South Wales and South Australia. He and his brother, Sackville, acquired their first property in 1895 and built it from there. He eventually owned or had a large interest in as many as 68 separate stations covering an estimated 220,000 – 280,000 square kilometres. Sidney Kidman was knighted in 1921 for his services to the 1914-1918 war effort supplying the troops with wool, meat, horses, ambulances and planes. 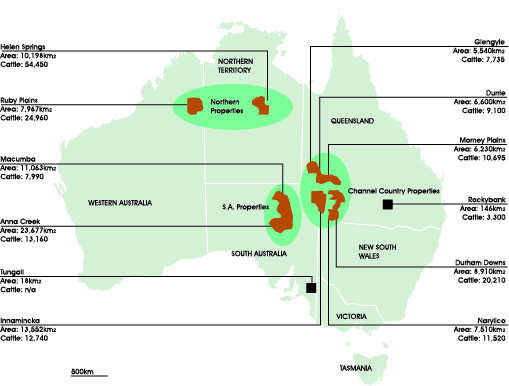 Kidman & Co. Ltd is currently a privately-held unlisted public company and is Australia’s largest private landholding. The business is majority family owned. The business includes 12 property aggregations across 16 pastoral holdings in South Australia, Queensland, Western Australia and the Northern Territory including 3 properties engaged in the cattle feedlot, cropping and breeding, plus the Adelaide Head Office. The company’s landholding covers 101,000 square kilometres. The crowd-funding campaign to acquire the Kidman Station via the DomaCom Fund will separate the land component from the operating business. Indicative returns around 8% – 9%* from combined rent and capital growth. Please note that the crowdfunding campaign to acquire the Kidman Station via the DomaCom Fund will be restricted to the land component only. DomaCom is seeking interest for the operating business. *This is an estimate only based on DomaCom’s assessment of the value of the land component. S. Kidman & Co. Ltd is a stable multi-generational business. DomaCom is keen to see this iconic agricultural business remain in Australian hands and this is a great way for Australian Mums and Dads to “own a bit of the farm”. We have been overwhelmed by the positive responses and feedback for the Kidman Station crowdfunding campaign. To date, we have received over 4,000 Expressions of Interest and recorded in excess of $60 million. Rural property is a forgotten sub-class of the broader property asset class but is considered a defensive asset because of its long-term nature as the foundation of our agricultural and pastoral industries – our food producers. Australia has some of the best agricultural and pastoral property in the world and whilst currency and commodity prices fluctuate affecting the businesses upon the land, the land itself is a relatively stable asset in terms of value and yield. DomaCom’s crowdfunding campaign for the Kidman Station presents as a good investment. 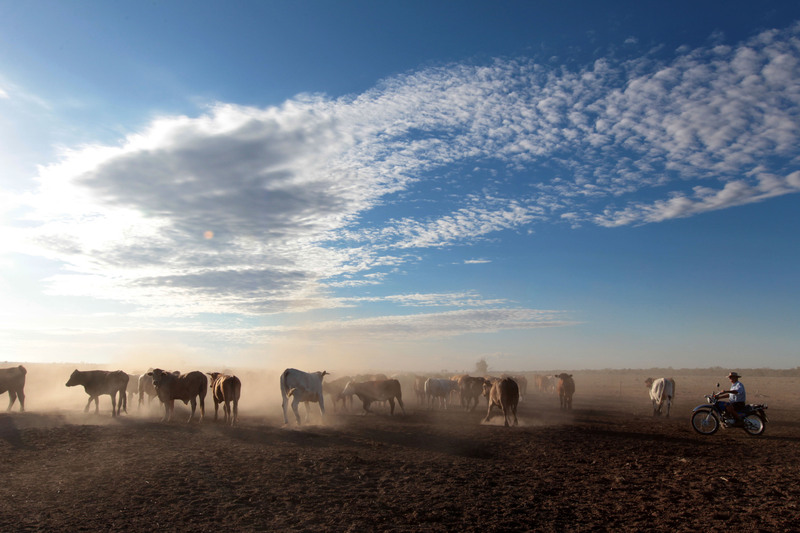 Whilst the campaign comes late in the day, the high profile of the Kidman Station has brought to the surface an appetite among Australian investors for rural exposure. A recent survey of respondents to the Kidman campaign revealed 33% have SMSF, with the balance spread across the industry, retail, corporate and public sector super funds. Rural property, generally, is a higher yielding class of property than residential, depending on whether it is pastoral or used for cropping, and where it is located. Long term tenants are another feature of the rural property that lends the sector a higher degree of stability. We recently surveyed thousands of respondents to our Kidman Station crowdfunding campaign to find out what type of superannuation they have. Many people had told us they wanted to have some control over their super that would enable them to put an investment like Kidman into their super but were unable to do so. From the responses, we received only 33% said they have SMSF but want to include a property investment of some kind. Therein lies the opportunity for financial advisers, and the DomaCom fractional model will accommodate the demand. The DomaCom model also provides a secondary market. There are and will be many more opportunities to acquire interests in agricultural and pastoral properties in this way and with a growing appetite, we believe financial advisers should position themselves to accommodate the demand. 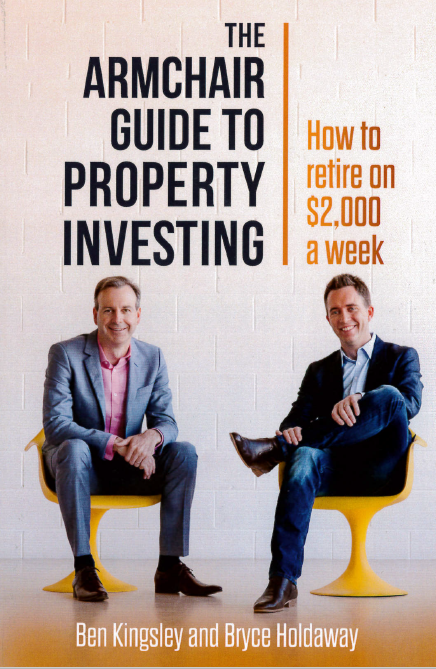 The DomaCom Property SMSF is a low cost, start-up Self-Managed Super Fund (SMSF) that nurtures young investors with a ‘seed’ investment in property within an SMSF. The idea is that as the young investor’s SMSF grows and they diversify into other asset classes, the super fund becomes a more mainstream SMSF that will require the adviser’s asset allocation and diversification expertise, to eventually become a long-term full-service fee-paying client. For the financial adviser, the Property SMSF is a nursery that will help seed tomorrow’s clients today! A DomaCom Property SMSF can be established with as little as $2,500 for your client with a direct application to the DomaCom Fund’s Cash Pool. Your client can then join a property bookbuild, a process that enables a group of property buyers with a common goal to invest in a specific property without committing to purchasing the entire property. A choice of properties on the DomaCom Fund. We are a proud sponsor once again of the upcoming SMSF Association National Conference in Adelaide, 17-19 February 2016. Following the positive response to the lifecycle theme at last year’s conference, the Association is convinced it should adopt this approach again. Commenting on this year’s recycled approach, Association CEO Andrea Slattery says “We received very encouraging feedback about how understanding the SMSF lifecycle provided the correct architecture for the conference. We believe that better outcomes arise when professional advisors and trustees are armed with the best and latest information most appropriate to their circumstances. Visit DomaCom at Stand 43 to find out more about how you can use the DomaCom fractional investing model for your clients. If the DomaCom Fund is on your APL you can also enrol for the accreditation program for an extra 4.25 CPD points. We look forward to seeing you there. DISCLAIMER: DomaCom Australia Ltd ACN 153 951 770 is the holder of an Australian Financial Services Licence (AFSL) 444365 and is authorised to provide general financial product advice, to deal in certain financial products and to make a market in units in sub-funds of the DomaCom Fund ARSN 167 020 626. Whilst DomaCom has taken all reasonable care to produce the information in this material, it does not make any representations in respect of, or warrant the accuracy, timeliness or completeness of any of the information. The information provided in this material is general information only. It does not constitute financial, tax or legal advice or a forecast. This information has been prepared without taking into account your personal objectives, financial situation or personal needs. Before acting on the information or deciding whether to acquire or hold a financial product, you should consider its appropriateness. It is recommended before making any investment decision, that you seek independent financial advice and read the relevant Product Disclosure Statement (PDS) and any Supplementary Product Disclosure Statement (SPDS) available on the DomaCom Ltd website, www.domacom.com.au, or by phoning 1300 365 930.